Mark your calendars and share the news with your friends and family! Come celebrate our 3 year anniversary with us April 8th, 2017 from 12-10pm. We will have awesome raffle prizes, lots of live music, BBQ and of course BEER! We will also be featuring some specialty brews for the special occasion. 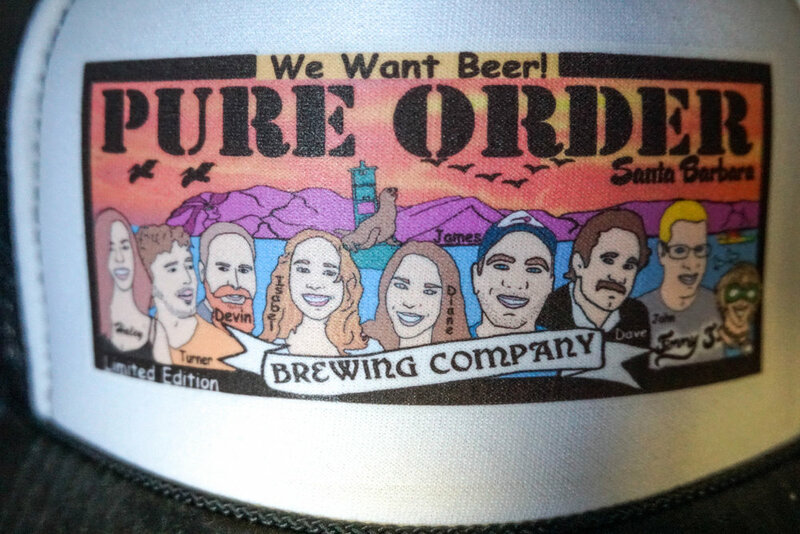 New YETI Growlers & Legacy Hats at POBC: New YETI Merch and New Hats Have Arrived at Pure Order Brewing Co.! Read on for more info and for a special limited edition offer on our YETI growlers. Is brewing beer a form of art? I don’t really know the answer to this question but let's explore both sides of the argument. While brewing beer requires creativity as well as the ability to push the limits on certain styles, there is a distinct scientific side to brewing that can’t be ignored. Charity Tap featured local food, craft beer and a raffle. 10% of all tap purchases were donated to United Way of Santa Barbara’s nationally-recognized Fun in the Sun (FITS) summer learning program, as well as other collaborative educational initiatives in Santa Barbara County. Why We Filter Our Beer at Pure Order Brewing Co.
Filtered beer or beer that is filtered, if you are trying to sound smart, is beer that has been filtered. Filtering beer is very similar to water filtration. It is a process that takes out the turbidity inside the beer. New Russian Imperial Stout at Pure Order Brewing Co.! Pure Purpose Holiday Market at Pure Order Brewing Co.
Join us this Saturday, December 10th from 1-6pm at the brewery for the Pure Purpose Holiday Market. Pure Purpose is a different kind of holiday pop-up market that aims to promote local and purpose-driven shopping. New Merchandise at Pure Order Brewing Co.
Wishing everyone a Happy Thanksgiving from the Pure Order Brewing Co. Crew! We have new Pure Order merchandise in just in time for the holiday season so come party with us this Friday-Sunday for Thanksgiving weekend and stay tuned to score some deals on merch and more on Black Friday! For deals and all the latest events and info follow us on social media: Facebook and Instagram. Have you seen Baby Blue cruising around town? Ever wonder what it was like to go on a beer delivery? Come cruise with the Pure Order Brewing Co. crew as we make deliveries and stop in at the local favorite, The Nugget in Summerland. As our very own James Burge, owner and brewmaster explains, "We have this custom 1977 Volkswagen transporter bus that we fully restored, painted it our nice Pure Order blue, have our little logo on the side and we putz around town delivering kegs and bottles to where they need to go." So come cruise with us with this behind the scenes video. Check out more on our series "Pure Order Presents" & "Lessons from the Brewmaster" today and stop by the brewery today for a cold brew and a great atmosphere. We have newly extended open hours as well! We are now open Tuesday-Thursday 3-7pm, Friday-Saturday 12-9pm and Sundays 3-7pm. We have many events coming up this holiday season so check out our event calendar and if you are planning an event, consider having your event here at POBC! Contact events@pureorderbrewing.com to get started. Hope to see you soon Santa Barbara! This past Saturday was one for the books. Here at Pure Order Brewing Co. we are honored to have three Veterans, Jared, Timothy and Tyler on our team. We kicked off the weekend celebrating Veterans Day with $4 pints and kept that going all weekend long. Many thanks to our vets and all veterans who have sacrificed so much to keep the rest of us safe and free. Killer Kaya Live at Pure Order Brewing Co.
Next up was an amazing Saturday filled with sunshine, cold brews, Kaptains BBQ, and Killer Kaya playing live. There was an exciting pop up shop by Dahlia Vintage, Peace, Love, & Succulents, and so many more. It was so fun to see some Pure Local designers and creators showcasing their amazing clothes and jewelry at the pop up shop. The Kaptain himself grilling up all of our favorites! Kaptain's BBQ grilled up their delicious ribs, tri-tip sandwiches, mac n cheese and beans until closing time. We had a blast this Saturday enjoying our brews, BBQ, live music and local artisans. Thanks to everyone who hung out and celebrated with us! Peace Love & Succulents showcasing some beautiful creations!